The varied performance of Community Health Worker (CHW) programmes in different contexts has highlighted the need for implementation of research that focuses on programme delivery issues. This paper presents the results of process evaluations conducted on two different models of CHW programme delivery in adjacent rural communities in in Gem District of Western Kenya. One model was implemented by the Millennium Villages Project (MVP), and the other model was implemented in partnership with the Ministry of Health (MoH) as part of Kenya’s National CHW programme. Community Health Worker (CHW) programmes have been utilized globally as part of primary health care approaches for many decades . In most developing countries these approaches were strengthened in the late 1970s after the Alma Ata conference in 1978 that aimed at increasing access to health care through the call for ‘health for all’ . Several decades on, the performance of CHW programmes has met with mixed reviews. Cochrane reviews have provided evidence that establish the effectiveness of CHWs in certain key areas such as exclusive breastfeeding, increasing immunization uptake and fewer children suffering from fever, diarrhoea and pneumonia . However, other evaluations establish that in certain settings CHWs have been unable to decrease mortality and have provided poor quality services that were not consistent enough to substantiate impact [1, 4]. Clearly, while the use of CHWs has the potential to positively influence health outcomes of community members, there remain significant challenges in implementation particularly in national programmes when rolled out at scale . With respect to challenges in implementation, a number of common barriers have been identified which include community-level factors such as health beliefs, geography and infrastructure as well as broader health system factors such as remuneration and supervision . Irregular drug supply and inappropriate CHW recruitment have also been identified as factors that hinder implementation . In other cases, there may be a strong local demand for curative services and not the health promotion services that CHWs routinely provide . National-level CHW studies have identified four general problems: unrealistic expectations, poor initial planning, problems of sustainability and difficulty in maintaining quality [9, 10]. Yet, despite these challenges, it is still widely acknowledged that some role for CHWs is needed particularly in poor and underserved rural populations [11–13]. Given such varied performance of CHW programmes in different local contexts, calls for a comprehensive body of implementation research that focuses on CHW programme delivery issues are hardly surprising . Implementation research, which includes process evaluations, can assist in the identification of barriers and facilitators that influence the adoption and uptake of ‘proven’ health technologies and interventions . Within this type of analysis, we feel that the voices of CHWs themselves have the potential to greatly enrich our understanding of how implementation barriers are expressed and resolved in different contexts. Unfortunately, these voices are often conspicuously absent in CHW evaluation research literature . Towards this aim, this paper presents the results of a process evaluation of a CHW programme implemented within the Gem (formerly Siaya) District in Western Kenya. The CHW model was formulated and delivered by the Millennium Villages Project (MVP), a development programme with operations across sub-Saharan Africa since 2005. While our evaluation primarily focuses on the implementation of the MVP’s CHW programme, we acknowledge that implementation of research knowledge alone regarding programmes such as the MVP is not sufficient to ensure that the findings will get taken up by policy [17, 18]. For this to happen, research needs to be carefully mapped to the existing political and institutional context in which policies will be implemented . As a result, we enrich our evaluation by including a comparative assessment of a programme implemented in partnership with the Ministry of Health (MoH) as part of Kenya’s National CHW programme. The purpose of this is to elucidate how the MVP’s model differed to Kenya’s National CHW programme, which was under implementation at the time in a number of districts countrywide. We intend to answer the research question: what are the differences in implementation strategies between an NGO sponsored CHW programme and a MoH sponsored CHW programme? As such, our comparative analysis seeks to explore how common implementation barriers were handled by the respective programmes, which were located in adjacent villages with similar socioeconomic, demographic and health attributes . As a result of this analysis, we aim to make our recommendations relevant to CHW policy-makers and programme managers working within the Kenyan national system. The Kenya National Health Sector Strategic Plan II (NHSSP 2005-2010) was introduced in 2005. The plan laid great emphasis on taking the Kenya Essential Package for Health (KEPH) to the community and delivering improved services to the lowest level of health service delivery through a primary health care approach . Key to this strategy was the training of local community members to provide basic health services, and in so doing empowering Kenyan communities to take charge of their own health. This included the establishment of a Level One Primary Health Care Unit; a Community Unit (CU) to serve 5,000 people with a comprehensive well-trained volunteer CHW providing services to approximately 20 households. The CHWs were expected to provide basic health promotion and disease prevention services within the community. For every 25 CHWs there was to be one Community Health Extension Worker (CHEW) providing supervision and technical support. CHEWS were trained health personnel with certification in nursing or public health, and were MoH employees. Their responsibilities within the community health strategy included: facilitating trainings in the community, providing facilitative supervision to CHWs, and providing a link between CHWs and health facilities. At the same time, Community Health Committees (CHCs) were expected to organize community dialogue sessions to raise awareness of maternal and child health issues with the aid of data displayed on a community chalk board. Deliberations on community dialogue days were intended to inform the planning of community action days for health service delivery in the community. 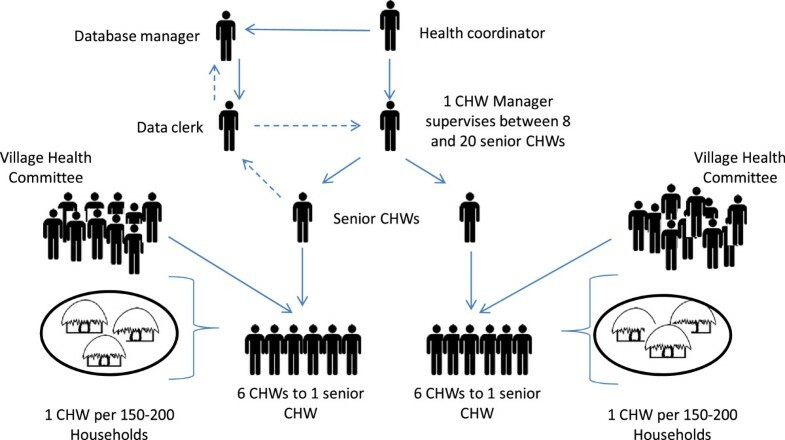 The recruitment of CHWs was to be done by each village in partnership with the CHCs (Figure 1). The strategy aimed towards reaching 16 million Kenyans or 3.2 million households . The Kenyan community health model. A Level One Care Unit serves a population of approximately 5,000. 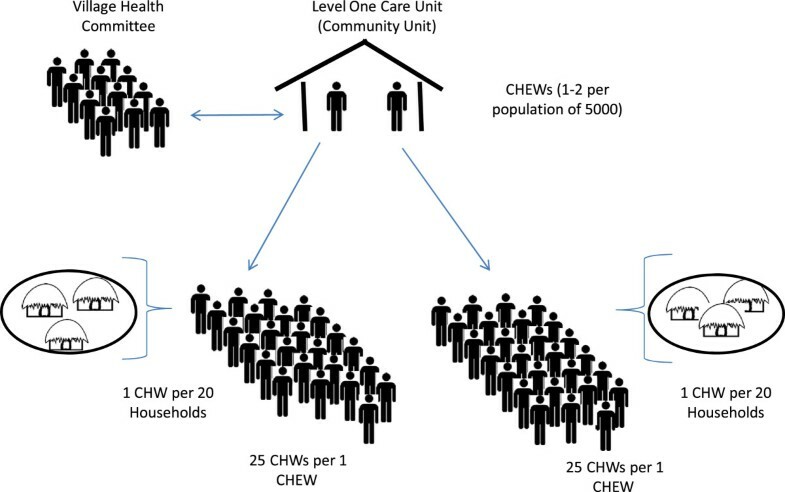 Between 1 and 2 trained and certified public health officers (CHEWS) each manage a cadre of 25 community health workers (CHWs), each of who are responsible for providing services to 20 households. Typically, there would be between 35 and 45 CHWs per village of 5,000. Village Health Committees work with CHEWs to mobilize and educate the community on issues of public health. Parts of the Community Strategy were revised in 2010 following resolutions of the MoH’s Health Sector Coordinating Committee (HSCC). Household coverage was revised to correspond with the population density ranging from one CHW covering 500 people for areas with dense populations in the provinces of Nairobi, Central, Western and Nyanza provinces to one CHW covering 50 people in sparsely populated areas in North Eastern province. Guidelines on contents of the CHW kit were also provided as part of the policy shift. These included basic drugs such as paracetamol, albendazole and tetracycline. The policy document also stipulated that the CHWs were entitled to a payment of KSh 2,000 (US$ 23) a month as a performance-based incentive . The MVP is an integrated, evidence based approach to rural poverty in sub-Saharan Africa, demonstrating the feasibility of systems delivery of health, food production, education, infrastructure and business development. The project serves as a proof of concept of accelerating progress towards the Millennium Development Goals targets. The project implements concurrent packages of MDG-focused interventions in agriculture, health, nutrition, education, water, sanitation, business development and infrastructure with an annual projected budget of US$120 per person per year sustained over a 5 to 10-year period, of which half is provided by national, regional and community partners and half is brought in by the project . The interventions were recommended as important components in achieving the MDGs by the United Nations’ Millennium Project. The project commenced in 2004 in Kenya in the Western region of Kenya in a village called Bar Sauri with a population of roughly 65,000 people in what was then the Siaya District (now Gem District) . The MVP’s CHW programme strategies, as well as procedures governing selection of MVs, are described elsewhere [25, 26]. In brief, the CHW programme of the MVP utilizes a workforce of CHWs, with each CHW serving at least 150 households and approximately 650 people. The MVP CHWs are supervised by senior CHWs in groups of six. The seniors are in turn supervised by Health Facilitators in a ratio of approximately 8 to 20 depending on the setting (Figure 2). The CHWs provide preventative care through health education and limited curative services. They are provided with a CHW kit that has basic drugs such as oral rehydration solution, zinc, paracetamol, Rapid Diagnostic Tests (RDTs) for malarial parasites, and Coartem for household-level treatment of positive RDT cases. The CHWs within the MVP are supported by Information and Communications Technology (ICT) systems that are facilitated through a mobile telephony system. The mobile heath technology uses information collected at the household level by CHWs to monitor child and maternal health, as well as monitor compliance with treatment administered at the clinic level. The system also prompts household visits via text message and generates feedback to CHWs and managers regarding the health status of individuals and communities. The MVP’s CHW programme. Total cluster size is typically between 35,000 to 70, 000, with village groupings of between 5,000 to 8,000 served by a cadre of 6 CHWs. Solid lines represent supervision, dashed lines represent flow of household health monitoring data. Monitoring data is collected by CHWs at the household level via mobile phones. Village Health Committees assist senior CHWs to monitor CHW activity at the household level. The two CHW programmes had very different access to resources - technical, material and financial. The evaluation was an implementation assessment that utilized process evaluation methods. Programme process evaluations typically attempt to verify what the programme is, as well as whether or not it is delivered as intended (or with fidelity) to the targeted recipients . In the majority of studies of implementation fidelity, this is done through examining intervention adherence; in other words, the extent to which the programme delivered adheres to the programme’s design specifications with respect to coverage, frequency and duration of the intervention . In addition to assessing intervention adherence, our evaluation also placed considerable emphasis on documenting the barriers and facilitators encountered when delivering the programme. These elements have been referred in the literature as intervention adherence ‘moderators’ , and cover a range of programme activities and attributes which include the comprehensiveness of the intervention policy; the support strategies adopted by the programme; the quality of the programme delivery; and the responsiveness of the programme participants . Following the model proposed by Carroll et al. ; we used these moderators as a basis upon which to build a conceptual framework for the assessment of programme barriers and facilitators in the implantation evaluation. 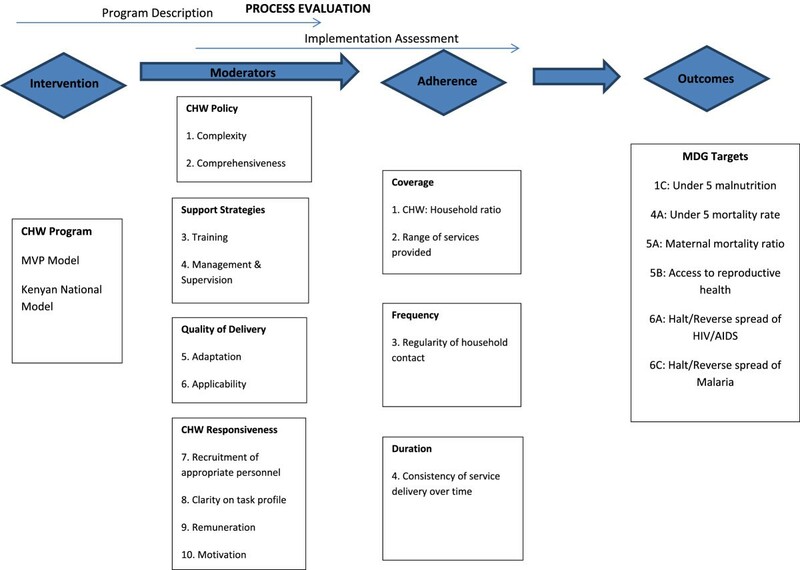 Within this conceptual framework, we identified ten priority assessment areas for CHW programmes which can be described as potential programme implementation moderators, and four priority assessment areas for programme adherence (Figure 3). Conceptual framework and assessment areas for the process evaluation. The two sites were chosen purposively. The two CHW programmes were drawn from neighboring sublocations within the Gem District of Nyanza Province in the rural part of Western region of Kenya: Bar Sauri (MVP model) and Ndere (Kenyan National CHW programme model). The Bar Sauri (or ‘Sauri’) sublocation has approximately 5,000 people within Yala Division and covers 8 square km. The Ndere sublocation has a population of approximately 2,000 people and is located approximately 10 km from Sauri . Household surveys conducted on 300 randomly selected households in each of the 2 central villages in 2005 also showed the villages to demonstrate similar socioeconomic, demographic and infrastructural characteristics (Table 1). Both sublocations have one health centre each. Both health centers offered outpatient services such as immunization, maternal and child health, nutrition counselling, HIV testing and antiretroviral drug (ARV) treatment. The Sauri health center also catered for normal institutional deliveries. How have programme designers conceptualized the CHW model? How complex and comprehensive is the model? What training did CHWs receive? How are CHWs been monitored and supervised on the ground? In what way has the CHW model been adapted by programme managers in response to local contexts? How relevant is the current CHW model to the local context? What were the CHW recruitment processes, and how effective were they at identifying appropriate community members as CHWs? What is the understanding of CHWs of their task profiles? What kind of remuneration do CHWs receive? Are CHWs adequately motivated and incentivized to effectively perform the tasks required of them? At what ratio of CHW: Household are CHWs functioning at? What services are actually been provided by CHWs? How frequently do CHWs visit their households? How consistently do CHWs deliver their required services? How consistent has been the delivery of services over time? The evaluation employed a number of methods to collect data, including a review of existing reports and records, site and facility visits, individual interviews, (n = 7), semi-structured interviews (n = 30) and focus group discussions (FGDs) (n = 6). The data was collected through a local research firm who interviewed the staff at both MVP and Ndere programmes. The evaluation questions that were used to guide interviews and focus groups are summarized in Table 1. The field work was conducted over 2 months between January and December 2011. A total of 30 semi-structured interviews, 15 in each site, were conducted with CHWs as the key informants of the study. The sample of CHWs chosen was a convenience sample. Individual CHWs were identified as interview candidates by the Health Facilitator in the MVP site, and following a focus group with the Community Health Committee and community leaders in Ndere. Each of the interviews was a minimum duration of 90 minutes and a maximum of 150 minutes. Six FGDs were also conducted, each comprising groups of at least six CHWs. Five FGDs were conducted among CHWs in the broader Sauri MVP cluster of villages. Only one FGD was conducted in Ndere due to the considerably smaller cadre of active CHWs in this site. Additional semi-structured individual interviews were conducted with CHW supervisors known as Community Health Extension Workers (CHEWs) within the national system and their counterpart health facilitators within the MVP system. Interviews were also conducted with two CHC members in each sublocation. MoH staff within Gem District were interviewed as well as their colleagues at the national level at the Department of Community Health Services. The evaluation design had a number of limitations and sources of potential bias, which should be stated. Firstly, the process evaluation was commissioned by the MVP and the first author served as the CHW programme manager for the MVP’s East Africa operations at the time of the evaluation. To avoid bias, she, however, did not participate in directly collecting the data. Secondly, because of the procedures for CHW selection, the Health Facilitators within the MVP might have selected CHWS who were more educated and hence more likely to provide good reports. This could attribute to some of the differences observed in the CHW profiles. The data was collected through a local research firm who interviewed the staff at both MVP and Ndere programmes. Moreover, additional attempts were made to minimize bias by stressing anonymity and having interviews conducted in the local language by a local research firm proficient in qualitative research methodologies. Coding was also carried out independently by the first, second and third authors in an attempt to minimize sources of potential bias. Discrepancies in coding were carefully flagged and reviewed by the first author. The CHWs interviewed from both programmes were similar in terms of age and marital status (Table 2), with 73% and 87% of Sauri and Ndere CHWs respectively being female. The Sauri CHWs were more likely to have received secondary education. The research was registered and overseen by Columbia University’s Institutional Review Board (IRB) and conformed to their guidelines for Human Subjects Research. The local IRB was also provided by the Kenya Medical Research Institute (KEMRI). All informants provided informed consent to participate in the study. Names and identifiers have been removed from all interview transcripts. The findings of this process evaluation are presented as follows. First, we assess the strategies adopted by each programme to encourage CHW responsiveness within each CHW policy, and critically discuss the degree to which the CHW recruitment, task profiles and models utilized by the respective programmes have responded to local challenges (quality of delivery). Following this, an analysis of implementation adherence is presented thematically in terms of the coverage, frequency and duration of delivery of services. This is followed by an analysis of implementation moderators that focus on programme support strategies. Specifically, we explore the types of support strategies offered by the respective programmes as outlined by the programme’s CHW policy, and assess the extent to which these have been successfully adapted by the programme managers to their respective local contexts. The CHWs were generally similar in terms of age and marital status, and this was particularly reflected in the recruitment strategies utilized during selection. MVP’s CHWs responded to a job advertisement with written selection criteria, which included: ability to speak both English and Swahili; basic literacy; having come from the local village and having lived within it for the past 2 years. The announcements were made at the chief’s baraza (a meeting organized by the area chief to disseminate information to community members). Posters with the recruitment criteria were posted within the village. The recruitment process in Ndere mainly involved Faith-Based Organizations. They sometimes used existing CHCs for mobilization and this was followed by announcements made mainly in church and at social gatherings. In one community, only those with training certificates were considered. Recent studies show that the selection criteria for entry to a lay health worker programme determine the profile of the workers that is eventually employed . Overall, the evaluation highlighted the value in a more detailed recruitment process including clear recruitment criteria and an interview process. Because MVP’s recruitment criteria for the selection of CHWs included criteria such as literacy, the MVP’s CHWs functioned well in tasks that required record keeping. The Ndere profile of CHWs, on the other hand, was based more on criteria such as ability to look after the sick and community respect. This resulted into a profile of CHWs who could mostly carry out health promotion and education. While this aligns closely to some of the policy expectation for CHWs, policy requirements such as information collection are also essential components of CHW work. A common problem with CHW programmes is a lack of clarity on CHW roles . This was reflected in our evaluation, with the Ndere CHWs in particular having descriptions of roles that went beyond what the MoH CHW policy had prescribed. Overall, the Ndere CHWs focused on describing health promotion activities and influencing community behavior with respect to hygiene and sanitation and bed net use, and household visitation focused on immunization compliance and referral of sick patients and children at the health facility. Ndere CHWs also described conducting general sanitation and hygiene education on the construction of dish racks, latrines, water treatment and washing hands. This was in line with the MoH formal task profile that was expected of them which called for basic preventative activities. However a few of them said they encouraged women to utilize family planning: something that was not mentioned within the official MoH CHW policy guidelines. Most of the Ndere CHWs also mentioned HIV/AIDS counselling and home-based care for people living with HIV/AIDS. These were duties that are not clarified within the MoH CHW policy. Despite these exceptions, overall the evaluation suggested that both Sauri and Ndere CHWs were primarily motivated by financial incentives. Remuneration, however, needs to be commensurate with the workload that CHWs are able to perform. The Sauri CHWs received almost double the rate suggested by the 2010 policy guidelines, but in certain contexts indicated that the remuneration that they were receiving for their work was incommensurate with the work that they were doing - particularly during scheduled campaign events aiming at universal household coverage. ‘Some CHWs cover up to 200 households! During the month of deworming you have to go to them all - and you can do nothing else on those days - it is like you have to work full-time from 8 am in the morning to late in the afternoon. And we are not supposed to be working full-time. So really if you wanted to visit all of those households every month you would have to be working full-time.’ (Sauri CHW focus group number 3). From these interviews, it is clear that adherence to a full-time work schedule is likely to prove challenging for some CHWs. Although the MVP has now implemented a full-time work and wage policy, a priority for future evaluations would be to assess whether CHWs are adhering to this policy. Ndere CHWs indicated that their duration of training depended on the sponsoring organization. CHWs were trained for an average of 4 weeks with a range of a minimum of 3 days and a maximum of 3 months. The training was organized at irregular intervals and the content would largely depend on the organizations responsible for funding the training. Some CHWs were trained on family planning by the German Development Agency (GTZ) and the MoH, while other CHWs were trained in water treatment by CARE. Some were trained by Comprehensive Course on Franciscan Missionary Charism (CCFMC) and St. Francis Community Development Programme (FRACODEP) on home-based care and hygiene and sanitation. Others were trained on Voluntary Counselling and Testing (VCT) and referral for ARV treatment initiation by the Centers for Disease Control (CDC). The evaluation of both the programmes highlighted the value of a coordinated and standardized training programme for CHWs. The MVP model of utilizing training for a period of 4 to 6 weeks with components held in field, classroom and facility is in keeping with recommended guidelines for CHW programme delivery . Although the Ndere CHWs had also received training from nongovernmental organizations (NGOs), interviews with government officials and CHWs both indicated that there was poor coordination between agencies and inadequate commitment to deliver training in sufficient quantities. In both programmes, CHWs indicated that they required additional training in soft skills such as counselling and more knowledge on infectious diseases. At the time of the evaluation, the MVP was in the process of revising their CHW training policy in order to meet with these emerging needs. Moving forward, the CHW National Manual may need to take into account these additional subject areas. Ndere CHWs were supervised by a combination of the health workers based at the nearby Ndere Health Facility and members of the respective CHCs. Health facility staff met with them on a monthly basis to discuss their reports, and the supervisor oversaw their activities. Despite this, some CHWs mentioned that sometimes the facility-based supervisors do not spend adequate time with them working on community issues and are largely absent from the field. Such feedback is not uncommon; where lack of health personnel coupled with poorly defined supervisory tasks have been identified as factors inhibiting the delivery of effective CHW supervision . CHW #1: ‘The community health committees do not understand the work of the CHWs. They do not understand our rosters or the fact that we work on flexible timing. They accuse you of not doing your work. They don’t understand that you might have worked long hours a day before in order to have some free time for some other activities’. CHWs have the potential to increase access to and coverage of basic health services. However, programme managers and policy-makers need to pay close attention to the details in implementation of CHW programmes if intended outcomes are to be achieved. Through comparing two different CHW programmes in neighboring villages, we highlight how the range of services offered by CHWs can vary with the implementation strategy. Prior evaluations of CHW programmes have typically recommended that for CHW programmes to be effective appropriate recruitment, adequate remuneration, strong supervision and support are essential [5, 9, 35]. Our evaluation revealed a number of ways in which effectiveness of CHW programmes within these areas could be improved. Firstly, programme managers and MoH programmes need to pay closer attention to the recruitment processes that they utilize. The criteria for selection of CHWs need to be clearly stated in writing and the candidate profiles need to be predetermined prior to selection. While there is merit in favouring candidates with specific community traits, such as volunteerism, the evaluation suggested that certain minimum criteria need to be adhered to. Moreover, human resource processes, such as interviews, are useful for assessing soft and hard skills before CHW selection is confirmed. It was particularly useful when these more formal processes followed initial screening at, for example, a chief’s baraza. Secondly, the evaluation suggested that the national policy might benefit from a clearer job description and scheme of services for CHWs. It would be additionally helpful if the typology of the CHWs was stated in writing before commencement of programmes. This would spell out whether the CHWs to be recruited are generalist CHWs who provide basic health promotion and disease prevention or whether they are CHWs who will be trained further in case management and provide some curative services. CHWs should be given guidelines and clear terms of reference that enumerate clearly both preventative and curative tasks that they should undertake within the community. For curative tasks, the tools of work and the drugs that they provide should be made available as per the CHW kit defined by the CHW policy. Thirdly, CHWs within both NGO and national programmes need to be remunerated a living wage to ensure motivation to the tasks required and to avoid attrition from programmes. However, it was clear from this evaluation that there appear to be significant challenges in implementing the 2010 policy of the Kenyan Government in offering CHWs a KSh 2,000 (US$ 22.50) stipend in the field. Options for community payment had not been considered because of the poverty levels within this district, and an earlier study by Ofusu-Ammah identifies community payment as being irregular and can lead to higher attrition . Clearly, financing modalities for this policy position need to be urgently catered for by the MoH through their donors to make implementation of Community Strategy a reality. Although a number of factors can lead to attrition, including poor selection criteria, lack of adequate support and the cultural environment, remuneration is a powerful factor in ensuring retention of CHWs. Countries such as Sri Lanka have previously utilized volunteer CHW programmes but have experienced high attrition rates making the programmes unsustainable . Moreover, whereas hope of eventual remuneration may well be a strong motivation for volunteers to join CHW programmes , it does not seem to stop CHWs from leaving . When present, attrition was usually attributable to a lack of prospects for CHWs to grow professionally within the system and the inability to balance the workload and personal commitments. Better integration of a model that proposes a living wage or offering prospects for professional growth within the health sector should be explored . Fourth, the important question of the optimal population size that a CHW can cover needs to be rethought . While coverage of households may be predetermined by policy, the reality is that in practice population size, typology and the availability of means of transport should guide the number of households covered by CHWs during their visits. From interviews with Sauri CHWs, at the time of the evaluation the target ratio assigned by the MVP of 1 CHW: 150 households was only feasible for a CHW working on a part-time basis when campaign events (such as door-to-door growth monitoring and deworming) were not underway. This was an important limitation of the MVP model, and a source of considerable conflict between CHWs and their supervisors. The lessons learned from this process suggest that ideally, CHW task loads should be established during recruitment with CHWs incentivized for extra duties performed outside of their regular task loads. Fifthly, with respect to supervision, most studies have identified lack of supervision and support has one of the biggest problems in CHW programme implementation [5, 6, 9]. On the whole, innovations such as the use of mobile telephony solutions to issue alerts to supervisors appeared to strengthen CHW supervision, as did the MVP’s policy towards frequent (biweekly) supervisory meetings and regular contact with CHWs in the field. Moreover, the existence of toll-free communication lines between CHWs and CHW supervisors in the MVP site was highly effective in monitoring CHW activities. Clearly, although many inroads have been made towards strengthening supervision within national programmes, there are a number of problems remaining. In addition to this, essential elements such as deployment of CHEWs, transport costs of CHW supervisors, areas of coverage and supervisory tasks of the CHW supervisors would benefit from clearer definition by the national policy. Sixth, our evaluation further emphasized the value of training, which is performed in a regular fashion ideally at a period of 4 to 6 weeks with components held in field, classroom and facility . For CHWs in the government programmes, this approach may benefit from being standardized using a MoH National Manual. The evaluation further suggested that NGOs implementing the national programme might benefit from more coordinated CHW trainings with the District Teams so that they prioritize pre-service training for CHWs as opposed to specialized areas of their own organizations interest. Moreover, in both programmes the role of the CHC needs to be carefully considered. While CHCs seemed to provide a useful link during recruitment and community facilitation, their role in supervision of CHWs is less clearly defined. The MVP, in particular, tried to implement a policy of active CHW supervision by CHCs at the household level, but in practice the feedback process between CHWs, CHW supervisors and CHCs was difficult to harmonize. This limitation has been recognized by the MVP, who has put considerable efforts into better refining the CHC supervision policy. Clearly, more needs to be done to utilize the CHCs as a governance tool in CHW programming. In summary, both the MVP and national CHW programmes both faced considerable challenges in implementation. Due to better flexibility, resources and scope for rapid innovation on the ground, the MVP model was able to introduce a number of innovations that aimed to strengthen CHW management, supervision and improve CHW responsiveness. Many of these innovations proved very effective in smoothing programme operations, but programme adherence still faced a number of challenges with respects to ensuring that CHW coverage was adequate, visitation frequency was sufficient and services were delivered with the same consistency over time by all CHWs. Since conducting the evaluation, MVP programme staff has continued to adapt the MVP policy in an effort to address these challenges, and all MVP CHWs are now paid a salary that is commensurate with a full-time wage . Adherence to this model, however, may still prove a challenge for some CHWs as CHWs typically hold numerous other responsibilities in the community, which they may be unwilling or unable to relinquish. This is an ongoing challenge for many CHW programmes, and is best addressed on a case-by-case basis by the policy-makers and programme managers both from the government and NGOs implementing these programmes on the ground. Further implementation research in this area will be a priority area for future evaluations, as CHW cadres become increasingly professionalized and these activities are scaled up throughout sub-Saharan Africa . JOA and SC participated in the design of the study and analyses. JOA wrote the first draft and SC revised the draft. MW and JN participated in reviewing and critically evaluating the manuscript. All authors read and approved the final manuscript.